В столице Молдавии десятки тысяч человек собрались на центральной площади на митинг против правительства. Участники протестов в Кишиневе потребовали отставки президента страны Николая Тимофти, сообщает «РИА Новости». Также звучат призывы объявить досрочные парламентские выборы до марта 2016 года, когда истекают полномочия действующего главы молдавского государства. Эти требования были озвучены на митинге, организованном платформой DA. Участники митинга зачитали с трибуны список совета «Великого национального собрания», состоящий из 10 человек. На них возложены обязательства вести переговоры с представителями власти. Ранее участники другого антиправительственного митинга «Наш дом — Молдова» («Красный блок») заявили, что будет установлен палаточный городок у здания правительства. Several protesters have been detained after tens of thousands of protesters in Moldova took to the streets of the capital to demand the dissolution of the new government following corruption scandals. Demonstrators gathered on Great National Assembly Square in downtown Chișinău on Sunday to call for the resignation of the president, Nicolae Timofti, early elections and punishment for those responsible for widespread embezzlement. Organisers claimed 100,000 people had attended the demonstrations, which were ongoing on Sunday evening, while police put the number at 35,000-40,000. The protest is the largest such action in the former Soviet republic, which has been one of the poorest countries in Europe since its independence movement in the early 1990s. Clashes broke out with police at the prosecutor general’s headquarters, where activists attempted to set up an occupy-style tent encampment. Opposition leaders have accused the prosecutor general of being an instrument of political persecution. Police detained several activists, several were injured and one woman was hospitalised, news agency Interfax reported. Tents were set up on the square, with activists tweeting that they intended to stay there until the government was dissolved. Some Russian and Ukrainian media outlets called the protests a “Maidan”, referring to the colloquial name of the months-long demonstrations in Kiev that ousted President Viktor Yanukovych in 2014 and led to a standoff between Russia and the west. Like Ukraine, Moldova has ties to both the EU and Russia, where many of its citizens work, but has moved toward European integration in recent years. Moldova’s parliament narrowly elected Valeriu Streleț as prime minister in July amid increasing political turbulence. Thousands protested in May after $1bn – equivalent to one eighth of the country’s budget – disappeared from three banks through mysterious loans. The International Monetary Fund and World Bank stopped lending to Moldova after the incident, and the return of the $1bn remains a key demand of the current protests. Streleț’s government has pledged to move the country toward EU membership and hold those responsible for the bank theft to account, but the opposition movement has accused it of not undertaking reforms in good faith. It also has blamed powerful oligarchs for wielding inordinate influence over the country’s economy and politics. Streleț was forced to meet with a contact group from the protestors, inviting them to further negotiations and promising to pass along their request to meet with the president. “Isn’t it the quality of the captive state, ridden with widespread corruption, that’s preventing the current government from applying for EU membership, as they promised during their recent electoral campaign?” civic platform Dignity and Justice, which called Sunday’s demonstrations, said in an appeal for support. Valentin Dolganiuc, a former MP and one of the protest leaders, declared that the demonstrators “cannot bear the authorities’ mockery of the country” and would seek to kick corrupt oligarchs out of power, Korrespondent.net reported. Among the other demands voiced by protestors were judicial reform, greater media freedom, the dismissal of the heads of numerous government agencies, and the cancellation of recent electricity and gas rate hikes. Other groups also joined in the demonstrations. Supporters of the far left party Red Bloc marched through central Chișinău, stopping at the home of oligarch Vladimir Plahotniuc before arriving at the prosecutor general’s headquarters and attempting to break through a police cordon, sparking clashes there. Footage from the scene showed demonstrators waving Moldovan, Romanian and EU flags while chanting “Resign!”, “We are the people!” and “Down with the mafia!”. Regional pop musicians have also been drawn into the standoff between protestors and the government. 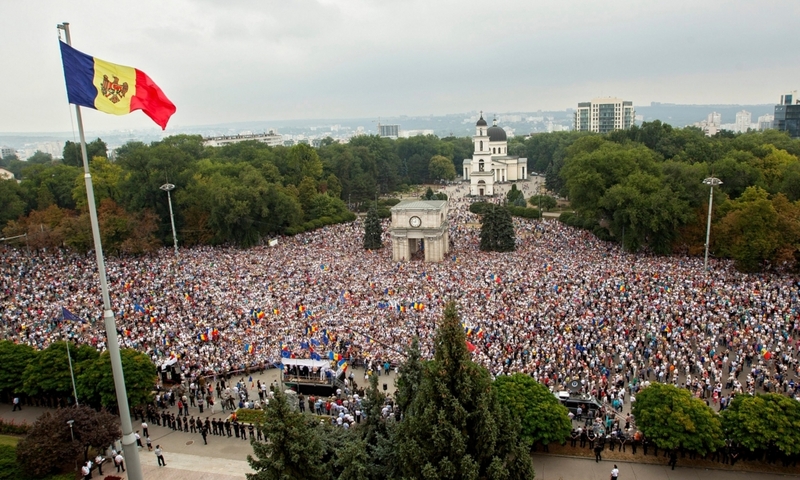 On Thursday, afree open-air concert in Chișinău was announced in a move that many saw as an attempt to draw people away from the planned anti-oligarch protest. Several Moldovan, Romanian and Russian performers refused to attend what many had dubbed a “mafia concert”.